If you are going into 6th-8th grades, you are invited to join our Leaf & Vine Club! Check the Calendar page for the date of the next meeting. You are welcome to join us any time at the Extension Office, 752 Old Knoxville Hwy., Sevierville. 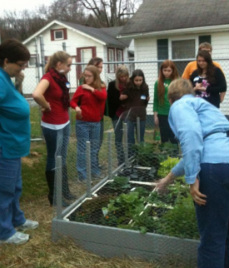 This club gets lots of leadership opportunities, including leading garden tours at the Sevier County Fair to show off their garden beds in The Teaching Patch. 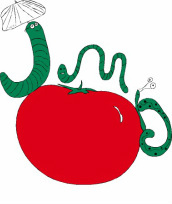 Our L&V JMG Clubs have raised beds in "The Teaching Patch," the SCAMGA Demonstration Garden. They are located behind the Sevier County Extension Office. 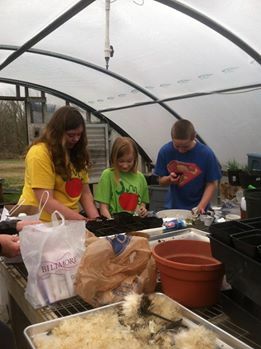 This gives the students lots of hands-on experience in building garden beds and maintaining plants and gardens. Lots of service hours were obtained planning, creating and working the projects for the JMG booth at the MG Plant Sale this year. We netted over $300, which goes toward the cost of JMG Camp and other club educational activities. The club worked at the Sevier County Food Ministry last November, unpacking crates of food. More projects with the Food Ministry are planned this year.